Today I received my 99.1 with silver dial, gold applied numerals, gold hands, quattro arret feature, and dark brown leather strap. 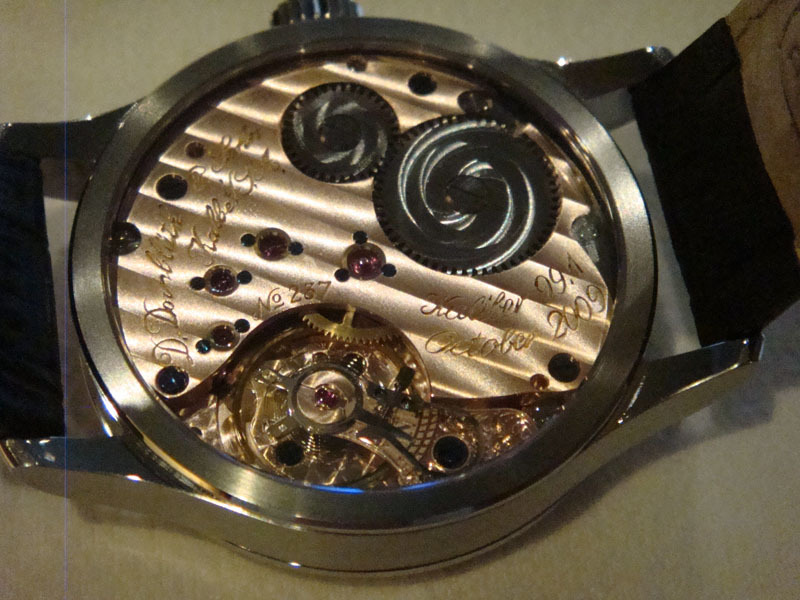 Sorry that I am not able to take better pictures, but the watch comes to life when light hits it at various angles. 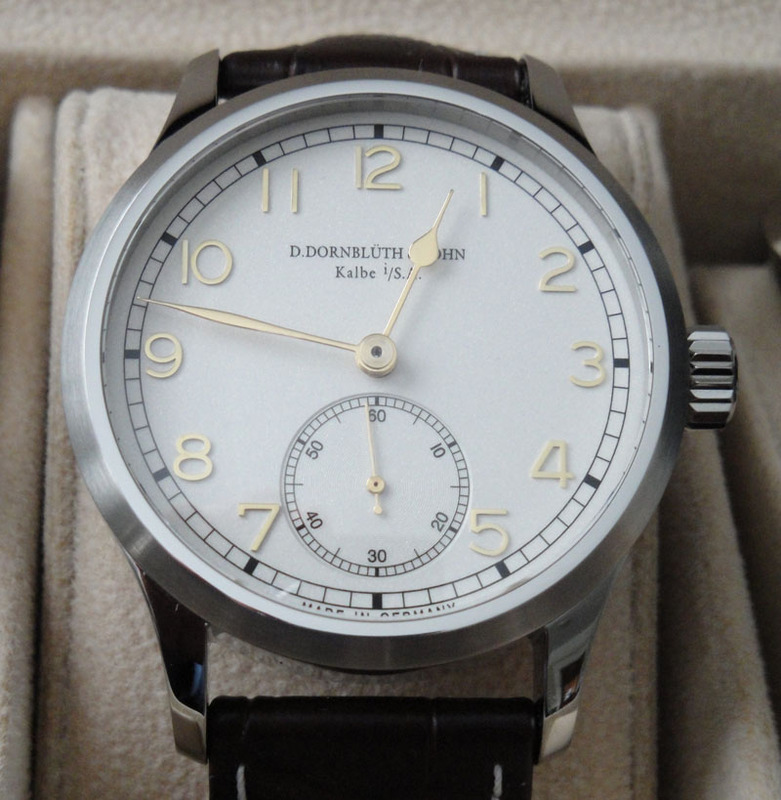 To say that I am thrilled with the watch is an understatement, and I look forward to many years of enjoyment with my Dornblueth. Wow. Allow me to be the first to admire and offer congratulations. No reason to be shy about the photograph either. I think you made quite the inspired choice. 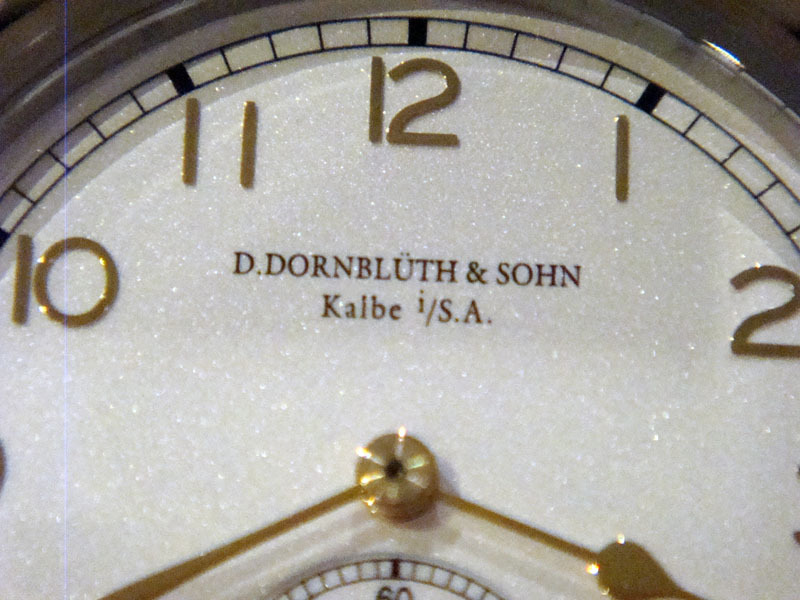 The Dornblueth DNA is quite clear, and the theme of "silver & gold" is striking. I can imagine, as you say, that in the light this watch must really shine. 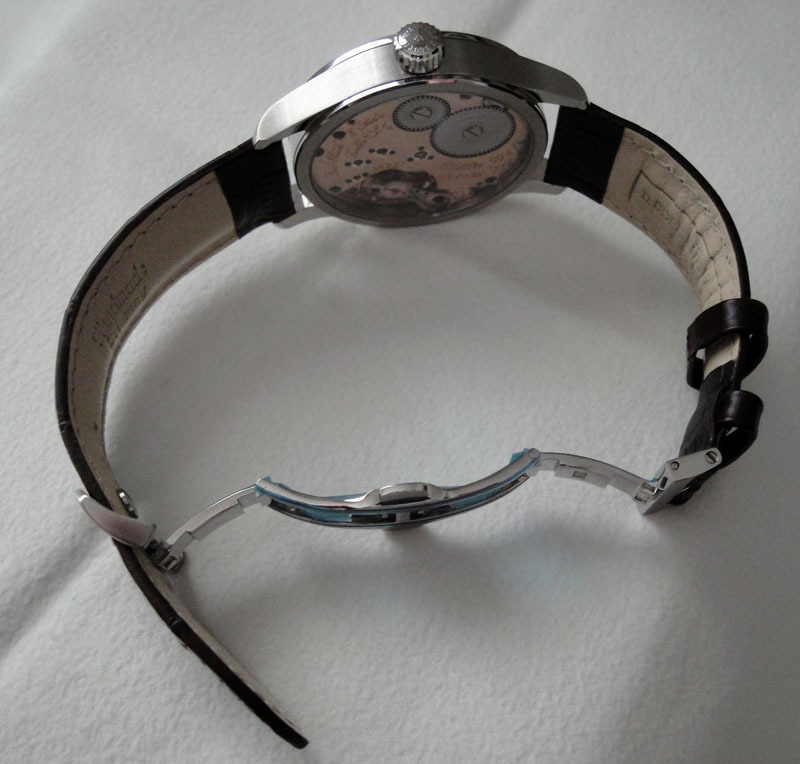 You and Dornblogger should figure out a way to juxtapose your most recent watches for a photo. tee530 wrote: Wow. Allow me to be the first to admire and offer congratulations. No reason to be shy about the photograph either. Thank you for the positive comments. Yes, and I just saw Dornblogger's photo of his "Stealth" for the first time today, and it instantly resonated with me as a perfect blend of understatement yet elegant, traditional yet unique. 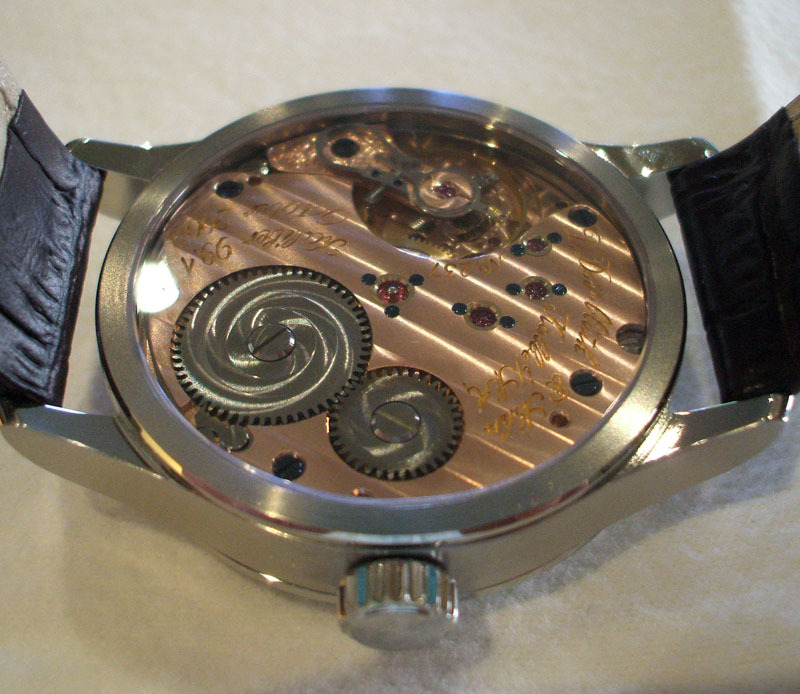 Anyone that owns a Dornblueth is probably just of proud of the back of the watch as they are with the face. 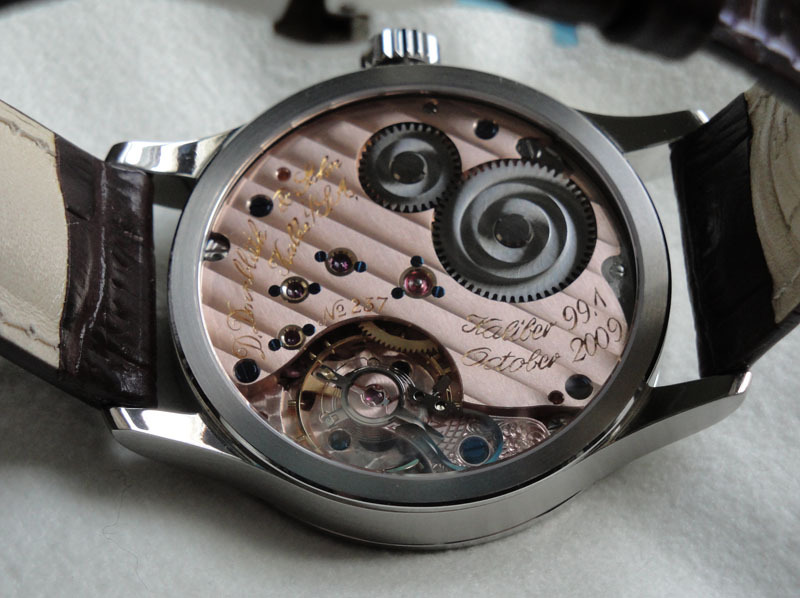 Below is my feeble attempt at taking pictures of the beautiful movement displayed in the back. Vince, thanks for posting those fabulous photos. Your watch is an original. Wear it proudly and often in good health! dornblogger wrote: Vince, thanks for posting those fabulous photos. You're watch is an original. Wear it proudly and often in good health! Thank you Dornblogger, it is appreciated. Looks great! 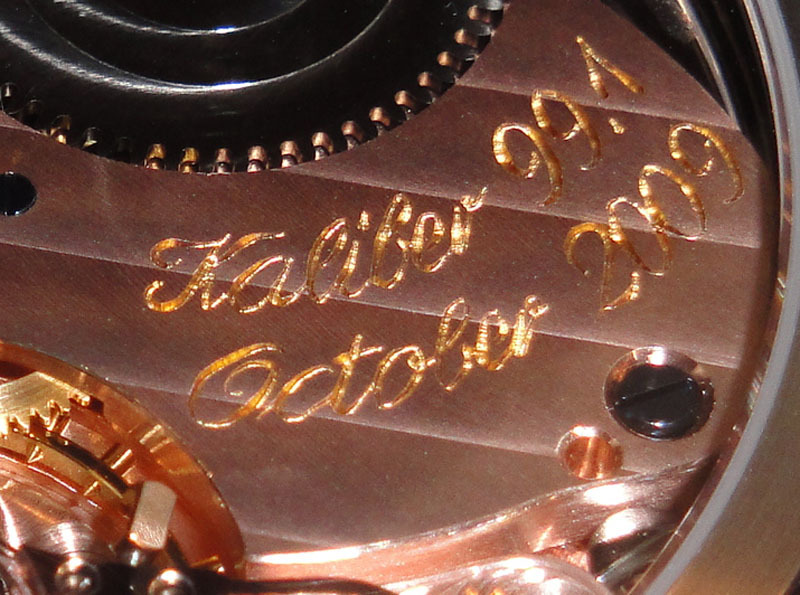 Did you ask for the calibre and date engraving in the movement? 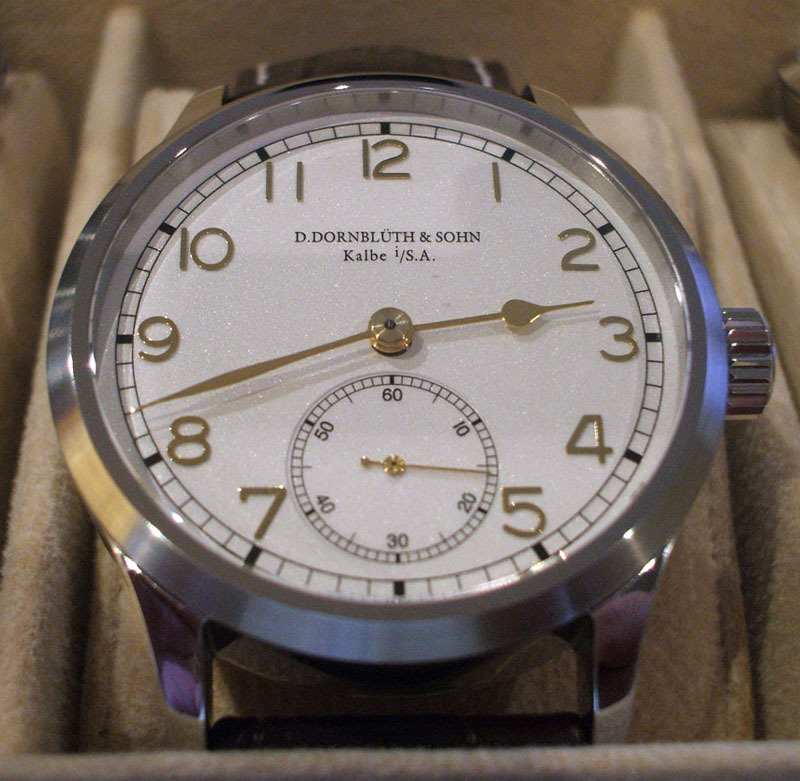 The additional sunbursts and the unusual dial/hand combination make this watch a true original! Enjoy it! Cheers! Congratulations, Vince - I hope you feel it was worth the wait! I really like the additional sunburst detail on the back - looks fantastic! Nice photos of the back too. Thanks for the very kind post. 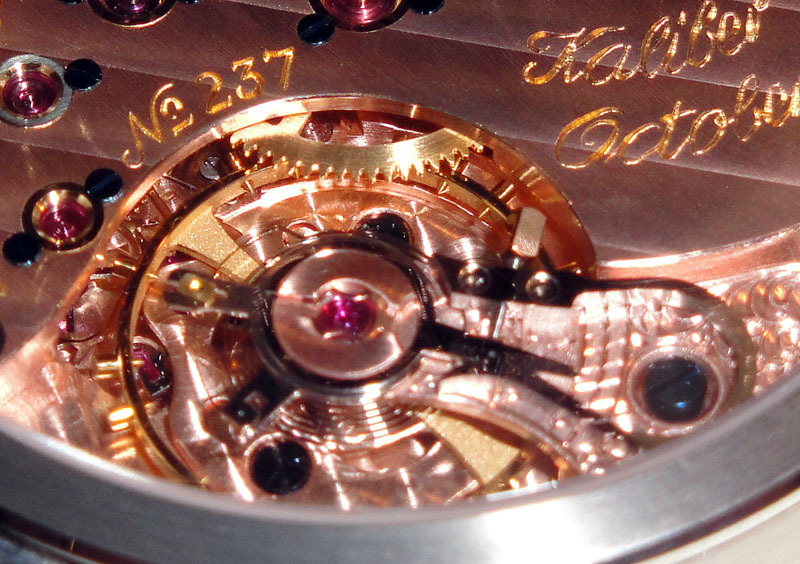 Yes I did request the calibre and month/year of the watch's manufacture to be enscribed on the 3/4 plate. I specified the gold hands and quattro arret center pin, as I thought it would ve a good match with the gold applied hour markers. 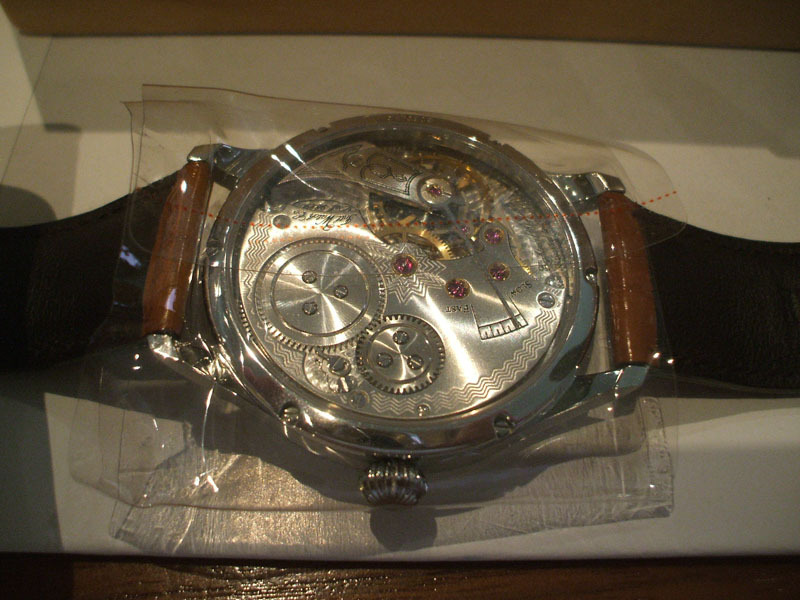 This forum was quite helpful as I viewed pictures of other watches and spoke with forum members, before ordering. You never know how these items will come together and look when ordering the watch, but I am extremely pleased with the end result. tee530 wrote: Nice photos of the back too. Wow! Thank you for your complimentary post. 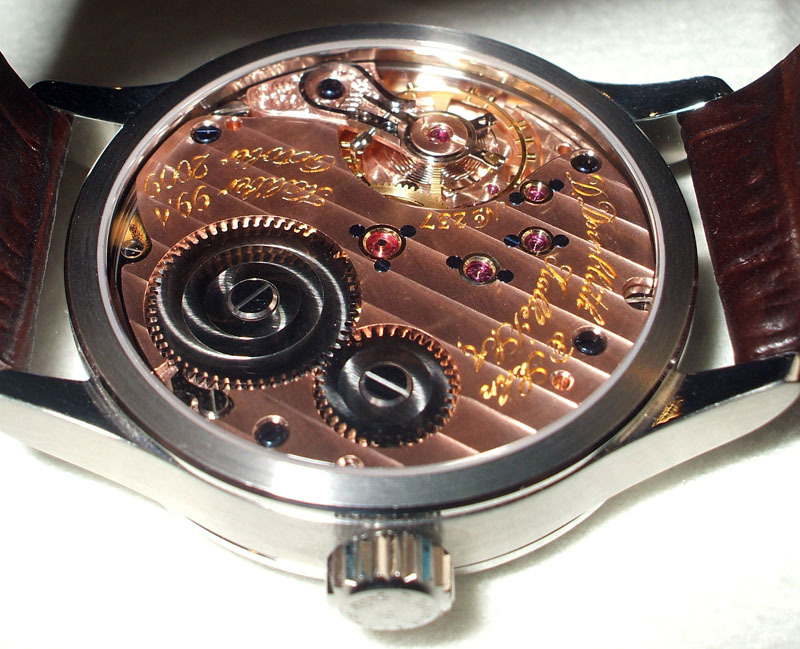 I felt great about the watch when it arrived, and even better now with all the positive comments. I thought I was going to get slammed for not having the traditional blue hands, but the design of these watches is so fundamentally timeless that it looks great in a variety of combinations. Makes me want to work on another 6 month Dornblueth project! Makes me want to work on another 6 month Dornblueth project! Mark wrote: Congratulations, Vince - I hope you feel it was worth the wait! Thank you and yes it was well worth the wait. I also appreciate that you noticed the sunburst patterns on the wheels, you have great attention to detail. 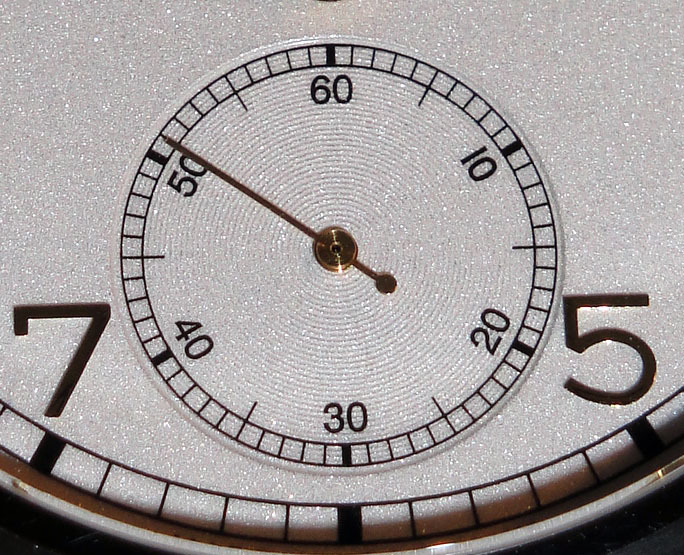 That would be beautiful, as the dark contrast of the dial with the lighter hands and numerals would look great. 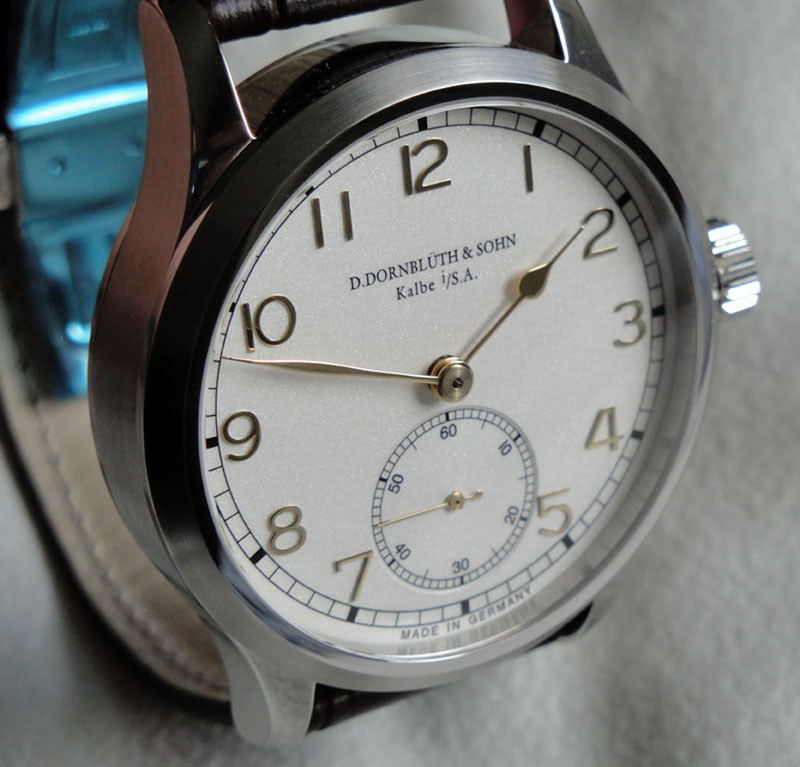 Any suggested combinations for a Dornblueth with an enamel dial? 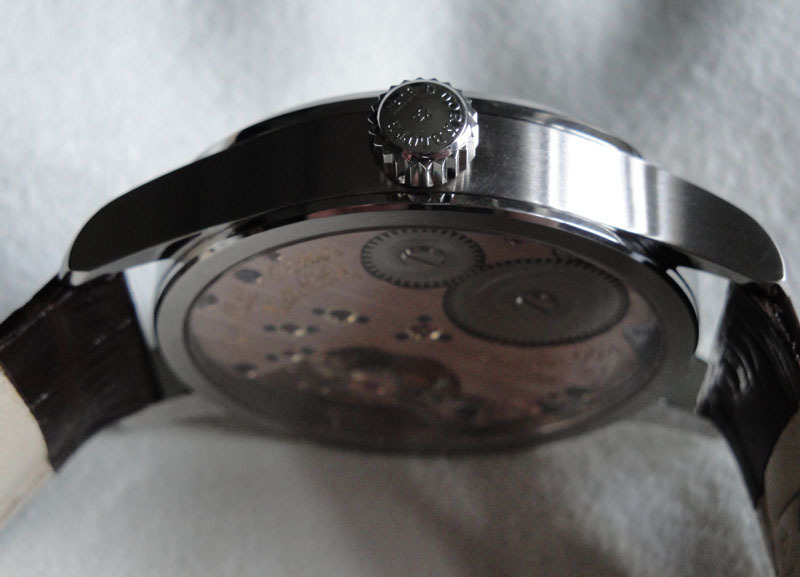 I tried to shoot the watch with a different camera and pick up the concentric circles in the subdial and better detail on the back. 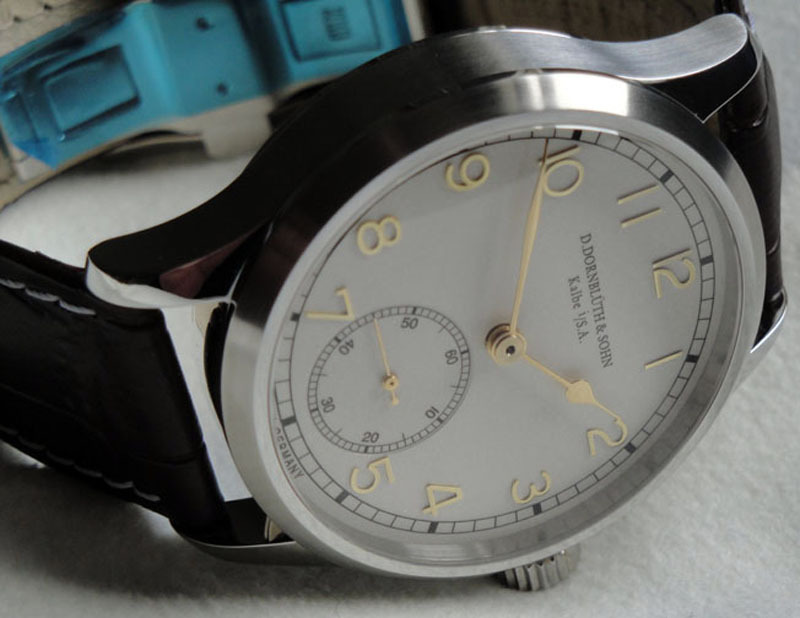 vincesf wrote: Any suggested combinations for a Dornblueth with an enamel dial? Maybe it's unimaginative, but I think the combination of blued steel hands with the enamel dial is too classic to mess with. All of the pocketwatch designs I like pair these two. 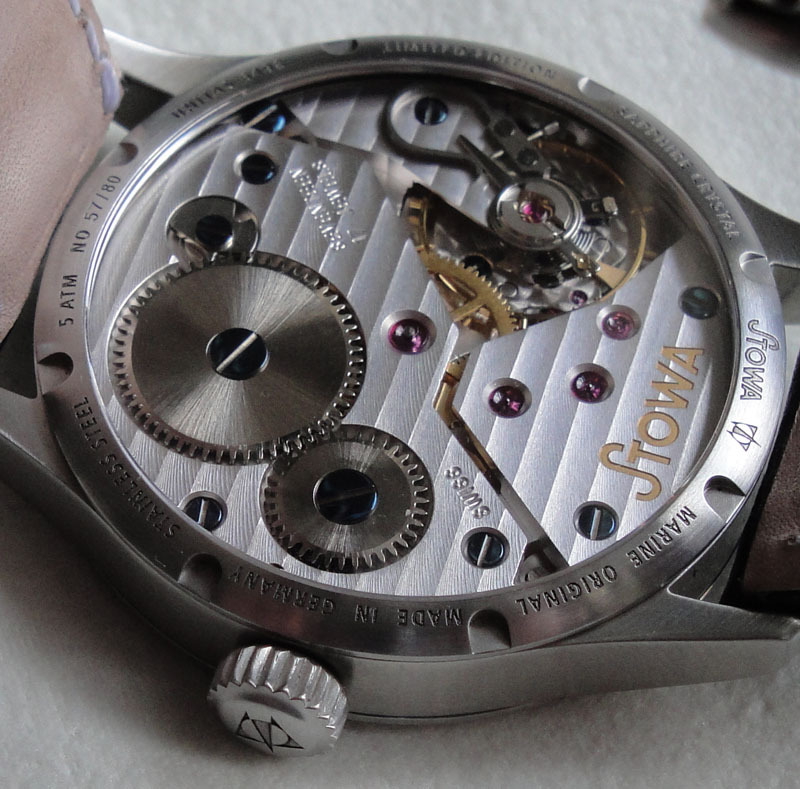 One of my favorite traditional large watches with a subdial is my Stowa Marine Original Limited Edition watch with enamel dial. One of the best aspects of this watch is that it introduced me to Dornblueth, as there is a cross section of fans from both camps. 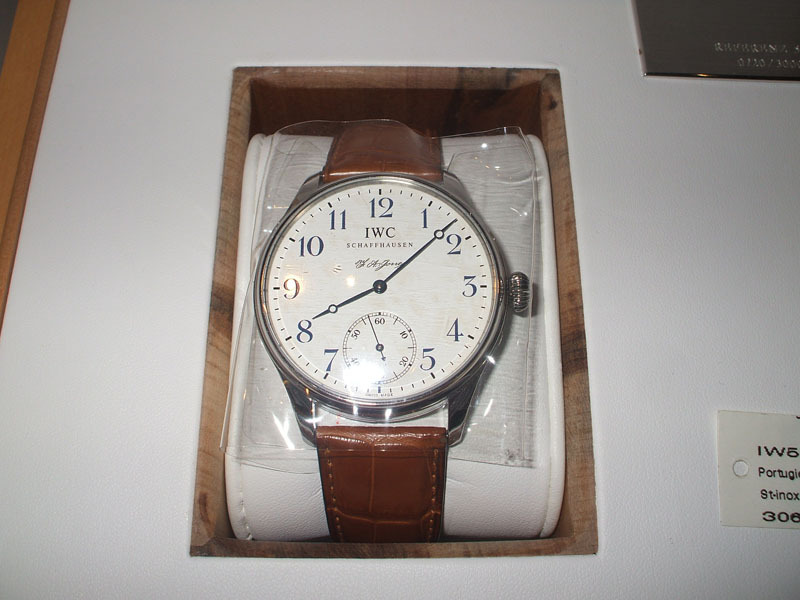 Then there is the IWC FA Jones, which also is one of my favorites. 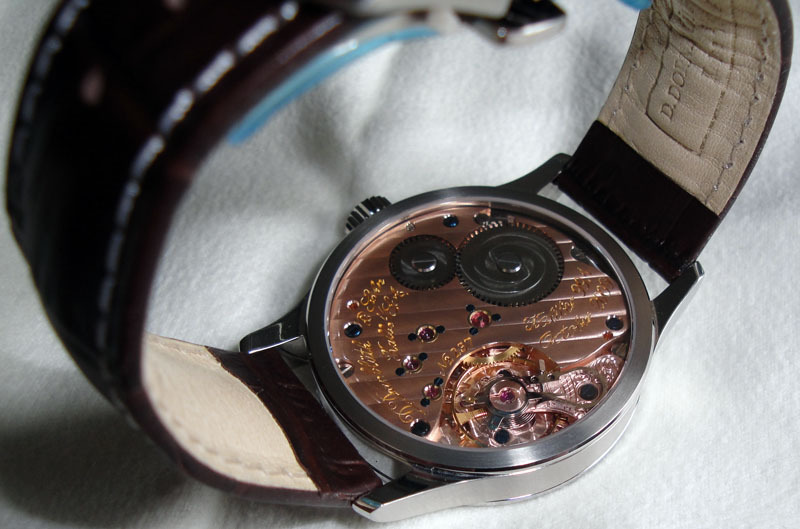 I must admit the movement looks rather plain in comparison to the Dornblueth. 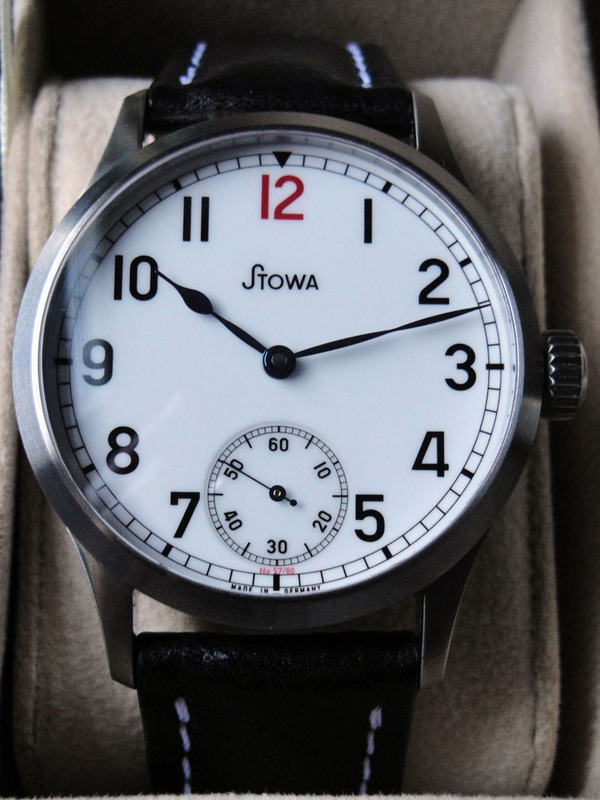 I love both your Stowa (especially the LE with the red 12) and your FA Jones. 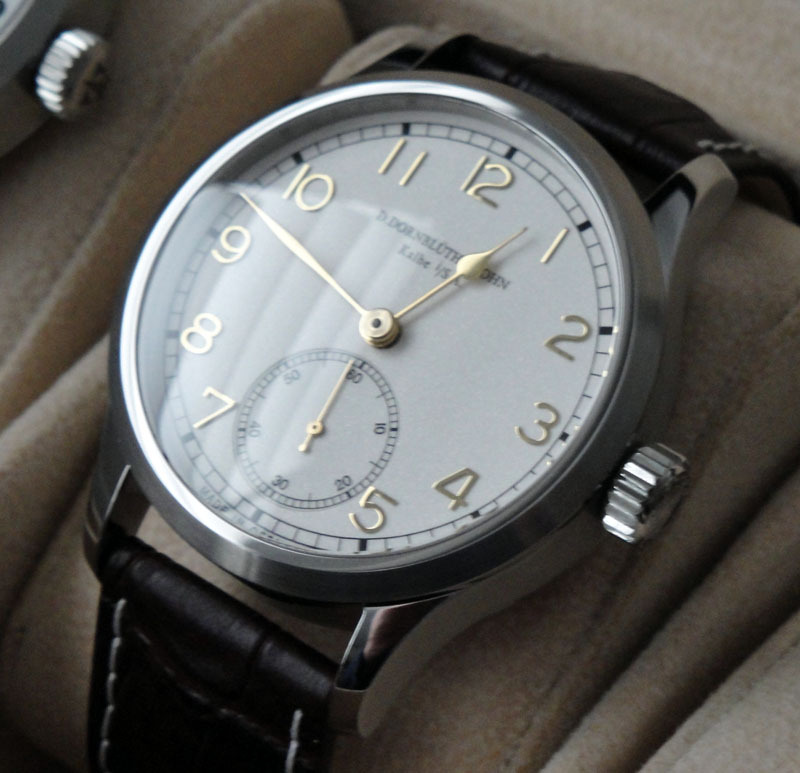 I came within a whisker of buying an FA Jones but ended up buying a Portuguese 7-day Automatic instead. Looking at your photos makes me wish I could have both! Your collection is really, really after my own taste - so I think you have superb taste! Thanks for sharing those fab photos.